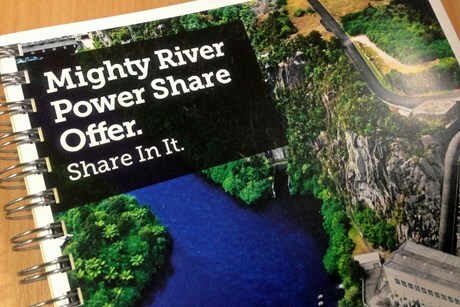 Mighty River Power might have to provide additional information to investors after its much hyped partial float was rocked by far a reaching power industry reform proposed last week by the Labour/Greens opposition. Prime Minister John Key said on TVNZ this morning that MRP needed to consider whether any additional advice now needed to be provided in the wake of the Labour/Greens announcement. Key also said that the Labour/Greens policy had now clearly shown that next year's election would be a choice between the "centre right and the far left". In response to an interest.co.nz query on whether the Government had instructed MRP to provide more information, the company's media relations manager Katherine Litten said: "Our Board, along with the Crown as Offeror, is reviewing the new information in the public domain from the Labour/Greens announcement and then considering whether or not any additional action is required with regard to the Mighty River Power IPO." Greens energy spokesperson Gareth Hughes said the PM was "right to say that Mighty River Power needs to consider revising its share offer document in the light of the joint Greens/Labour launch of the NZ Power plan". “The National Government needs to make sure Kiwis have full and up to date information when it asks them to buy Mighty River shares." Labour leader David Shearer had already approached MRP before the policy was announced suggesting that supplementary information would need providing. Labour and the Greens have said they would create a new Pharmac-style agency called NZ Power that would act as a single buyer of wholesale electricity. They estimated household power prices would drop by 10% to 14% after the reforms, which they said would create 5,000 jobs and boost Gross Domestic Product by NZ$450 million. Hughes said that MRP's share offer document needed to reflect the impact that NZ Power would have on the company. “Mr Key was correct when he said on TV this morning that the value of these companies will be less once NZ Power is implemented. That is because their values have been over-inflated well above what their actual assets are worth by excessive profits resulting from high power prices. “When NZ Power forces power prices down to a fair level, saving families $300 a year, there will be a consequent downward movement in the companies’ profits. "...Mighty River will still be profitable, but it won’t get away with charging exorbitant prices for cheaply-produced electricity any more," Hughes said. The Offer Document does set out a large number of potential risks for MRP. Included in these is the statement: "Changes in the regulatory environment may adversely affect Mighty River Power." Presumably the Crown and the company now have to work out whether this kind of statement covers them sufficiently in the event that all does not go well after the float. The offer to private investors opened last week and is set to close on May 3, so, there is not much time to get additional information out to potential investors. About 440,000 Kiwis pre-registered interest in the shares, which are being offered at NZ$2.3.5 to NZ$2.80. However, there is no binding commitment for these people to actually go ahead and buy shares. It comes down to whether a promised saving of $300 a year is worth more votes than a possible dividend above 4% after tax on an investment that would need to be how much to collect $300....seems to me the amount is way above anything your average debt ridden Kiwi family would have stashed away...! Why didn't the govt minders and string pullers ask themselves this question when they first grabbed hold of the SOE sale idea.! And the high debt levels are a result of what..unaffordable housing...caused by?